The Chicano Movement emerged in the late 1960s and early 1970s against the backdrop of the broader civil rights struggles in the United States. Advocating for equality at work, at school, and in housing, immigration, and social justice, farmworkers, artists, activists, and students called themselves “Chicanos,” asserting proudly their Mexican ancestry as well as their place, history, and identity in U.S. society. The Chicano Movement was multidimensional and artists played key roles in each realm. While Chicano artists like José Montoya worked with Cesar Chavez and Dolores Huerta to unionize the farm workers, artist Harry Gamboa led student walkouts in East Los Angeles. Gamboa and other Chicanx artists formed collectives like Asco (Spanish for “disgust”) while Montoya and others established the RCAF (Royal Chicano Air Force) to develop and disseminate their work through prints, murals, performances, and photography—media inherently accessible, participatory, and public. The RCAF was established in Sacramento, California in the early 1970s and was originally named Rebel Chicano Art Front (people confused the group’s acronym, RCAF, with that of the Royal Canadian Air Force, and so the more humorous Royal Chicano Air Force was adopted instead). The group was infused with humor from its inception, and the RCAF contributed to two major genres of Chicanx visual art—muralism and silkscreen printing. The RCAF is also credited with implementing art-based social programs that decenter the individual artist. In this way, Royal Chicano Air Force can be understood in relation to other art collectives of the 1960s and 70s—such as Fluxus—that also brought together musicians, writers, and artists in experimental performances that challenged the definition of art. Inspired by the culturally nationalist doctrine of the Chicano Movement, described in El Plan Espiritual de Aztlan (1969) and El Plan de Santa Barbara (1969), both of which exalted the indigenous roots of Mexican-American identity, the RCAF visualized the movement’s platforms, aestheticizing a Mexican-American history and identity. In solidarity with the labor-rights campaigns of the United Farm Workers union (UFW), founded by Chavez and Huerta, the RCAF mobilized Mexican-American students, educators, veterans, artists, and activists calling for economic, educational, and political equality in the United States. 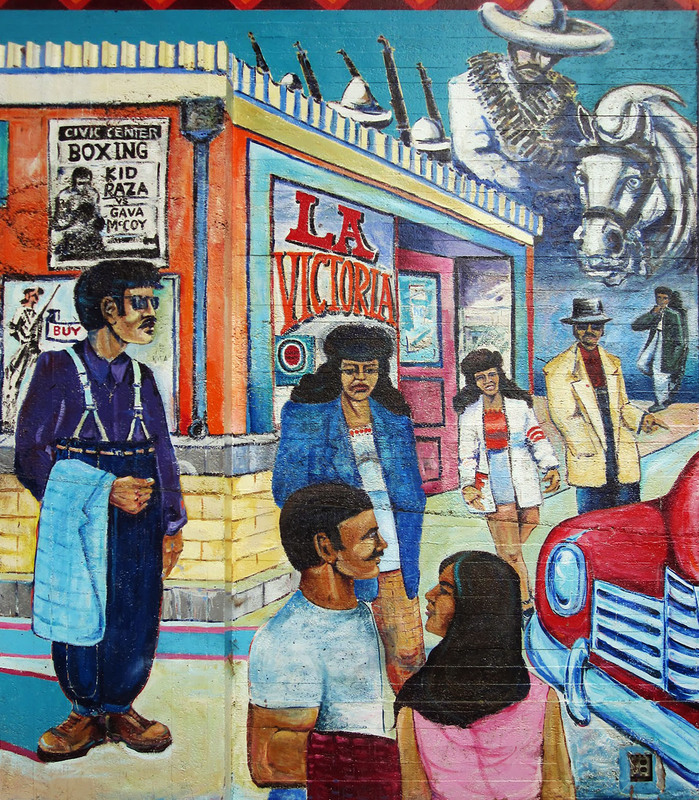 The group’s artistic diversity is evident in murals such as Southside Park Mural which consists of stylistically diverse panels by six artists extolling Chicanx culture and tradition. Created on an outdoor stage in Sacramento, the mural offers a culturally appropriate backdrop for community events, concerts, and festivals that celebrate Cinco de Mayo, Mexican Independence Day, and an athletic event called Barrio Olympics. In 1976, RCAF artist Ricardo Favela and member Rosemary Rasul negotiated with city officials to create the park mural. José Montoya, Juanishi Orosco, Esteban Villa, Stan Padilla, Juan Cervantes, and Lorraine García-Nakata each painted the panels in their own styles, reflecting the collective’s diversity. The distinct styles and motifs of RCAF artists is perhaps best exemplified in the social realism of Montoya, which draws attention to the conditions of the working class, and the geometric abstraction of Orosco. The mural panels draw on pre-Columbian, neo-Amerindian, and Chicanx youth iconography. For example, in the center panel, Esteban Villa painted a priest-like figure holding a newborn. The figures are rendered in broad strokes of color and a rosary, a Sacred Heart, and the word vida (life) can be seen. Flanking Villa’s panel on the left, Juanishi Orosco represented ojos de Dios (eyes of God) with Hopi influences, representing neo-Amerindian claims made during the 1960s and 70s Chicano Movement that sought to reconnect Amerindian cultures across the political border that now divides the United States from Mexico. To the right of Villa’s panel, Padilla continued the neo-Amerindian theme by blending indigenous imagery with a visualization of the moon’s cycle and a monarch butterfly, a species native to the region but also a prototype for the RCAF’s Metamorphosis mural planned later that year and installed in downtown Sacramento by 1980. The murals flanking the outer walls of the stage at Southside Park were created by Lorraine García-Nakata, one of the few Chicana artist members of the RCAF. García-Nakata designed, outlined, and painted two Amerindian women with open hands. While the women stand proudly with outstretched arms and from a position of power, they also seem to caution those who approach the stage, a message underscored by the size of their hands. The RCAF championed aesthetic diversity and labor equality, exemplifying members’ commitment to the United Farm Workers’ labor platforms. The group also rejected the notion of individual artistic genius, and capitalist values of art ownership. In fact, the practice of signing work shifted to include both individual artist and the initials RCAF, a practice that dates to the late 1970s when institutions began to collect Chicanx artwork. RCAF members were committed to public art. They painted murals and taught printmaking to their communities and to university students, as well as in local prison programs. They also exhibited artwork made by community members and by their students in both art institutions and in community spaces. In 1972, they founded the Centro de Artistas Chicanos as an operational hub for the RCAF and local area artists, in order to facilitate grants, teach classes, and better support community-based art programs. Cite this page as: Dr. Ella Maria Diaz, "Royal Chicano Air Force (RCAF)," in Smarthistory, January 29, 2019, accessed April 21, 2019, https://smarthistory.org/rcaf/.